Men’s Basketball ran through Gardner-Webb in the season opener at the Siegel Center 69-57 Tuesday night, led by redshirt-junior forward Isaac Vann’s 16 points. The win marked VCU’s 13th straight home opening victory. Sophomore forward Marcus Santos-Silva brought fans to their feet early as he blocked a Runnin’ Bulldogs shot less than three minutes into the game. The first five minutes of the contest were sloppy as both teams combined for seven fouls. Gardner-Webb took a 7-3 lead early in the first half, but the Rams stormed back after the slow start with a 9-0 run. The Runnin’ Bulldogs never regained the lead. 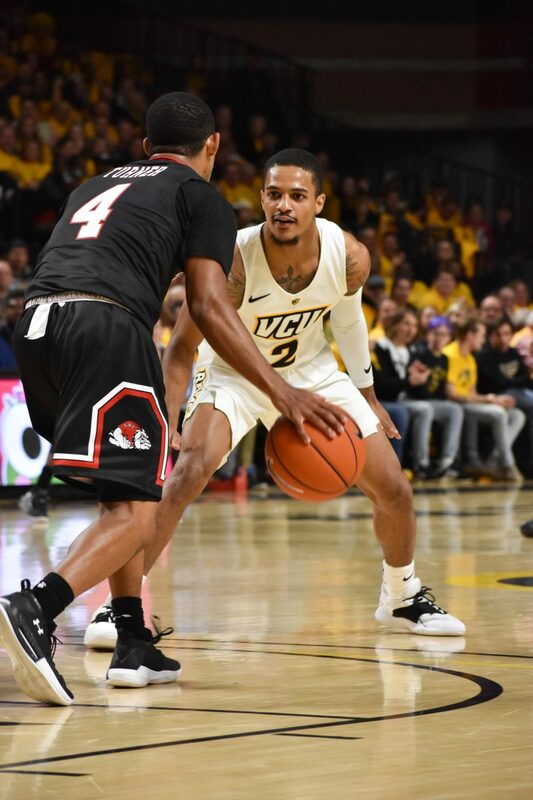 Redshirt-junior guard Marcus Evans made his VCU debut when he checked into the game to a raucous cheer midway through the first half. Evans returned from an Achilles tear that sidelined him for a majority of the preseason. Evans swiped a steal soon after but had the ball poked away as he attempted a dunk on a fast break. Vann turned up the decibel level in the Siegel Center with a big dunk over a Runnin’ Bulldog with less than 10 minutes left in the first half. The Rams used another run to extend their first-half lead, taking off on a 7-0 spurt. Redshirt-junior guard Mike’L Simms led the Rams in the first half with 12 points, all from beyond the arc. Simms shot 4-5 from three in the first 20 minutes. VCU opened up the second half on a 7-3 run to extend its lead to 20. Evans inbound the ball from under the hoop off the back of a Runnin’ Bulldog and layed it up to catch Gardner-Webb off guard with just under seven minutes left. He also drew a foul, but missed the free throw. Evans logged nine points in less than 10 minutes in his first game with the Rams, splitting time with freshman guard P.J. Byrd and junior guard Malik Crowfield at the point. Evans also recorded one assist and two steals. The Runnin’ Bulldogs made only two of their last 10 shots in the second half. 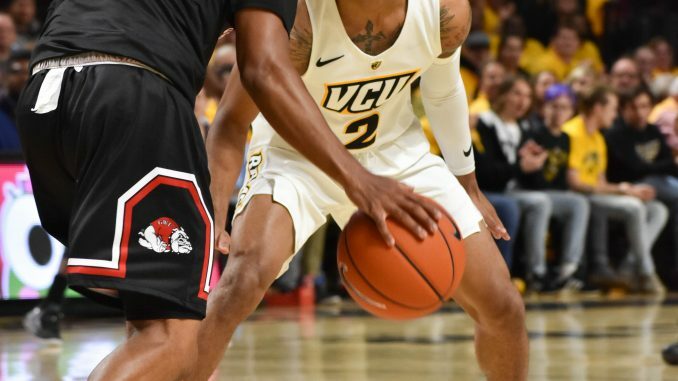 VCU turned the ball over 20 times in the opener, while Gardner-Webb logged 21 turnovers. Vann secured a team-high eight rebounds to go along with three assists. Rhoades said Vann took it upon himself to guard Preseason First-team Big South guard David Efianayi. Junior guard De’Riante Jenkins, redshirt-senior forward Michael Gilmore and Santos-Silva all recorded six points each for the Black and Gold.